I’ve been waiting for a good time to add Bruce to the Top 50. I figure now is as good as time as any with the release of Devils and Dust this week. 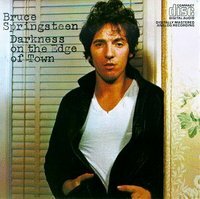 While Bruce’s body of work is as good as anyone’s, there are really only three of his records that I considered for the Top 50. They are Nebraska, Greetings from Asbury Park, and Darkness on the Edge of Town. Nebraska is an amazing record. I listen to it more than any of his records and maybe it should be Top 50 too. Greetings was my introduction to Bruce and I’ve always loved it. But Darkness is it for me. It is great from the opening Badlands to the closing title track. It has a drive, an energy, an attitude, and a desperation to it that makes it essential Top 50 material. I am particularly fond of the hard rock sound that Bruce and the E Street Band make on Adam Raised A Cain. There’s probably something to the fact that this record came out in 1978 when I was 17 and full of the feelings that are expressed so intensely on Darkness. Darkness speaks to me and that’s why its my pick this week. Welcome to the Top 50 Bruce. Listen to Darkness on Rhapsody.